“Strings of street lights–even stop lights blink a bright red and green as the shoppers rush home with their treasures…” goes the unforgettable refrain of “Silver Bells”, and what more festive way to describe “Christmastime in the city” (–or anywhere for that matter?) Would that the actual task of gift shopping were that poetic and simple! Luckily, for anyone on your list who may be “Dreaming Of A ’Great-White-Way’ Christmas” (including yourself,) “Broadway Cares/Equity Fights AIDS” has the answer! Via their on-line store, not only does this incredible foundation offer a virtual cornucopia filled with unique treasures for every lover of the performing arts–each purchase directly goes to help a terrific cause. “Equity Fights AIDS” was founded in 1987 by the stage performers union Actors’ Equity with the intent of providing assistance and support for those among their membership affected with HIV and AIDS in helping them combat its devastating effects. Through the efforts of Equity theatre companies across the country, monies raised were earmarked expressly for what was initially called the “Actors Fund’s AIDS Initiative“. Shortly after, in February 1988 “Broadway Cares” was founded by members of The Producers’ Group, with the money there being awarded to AIDS service organizations nationwide–including “Equity Fights AIDS“. 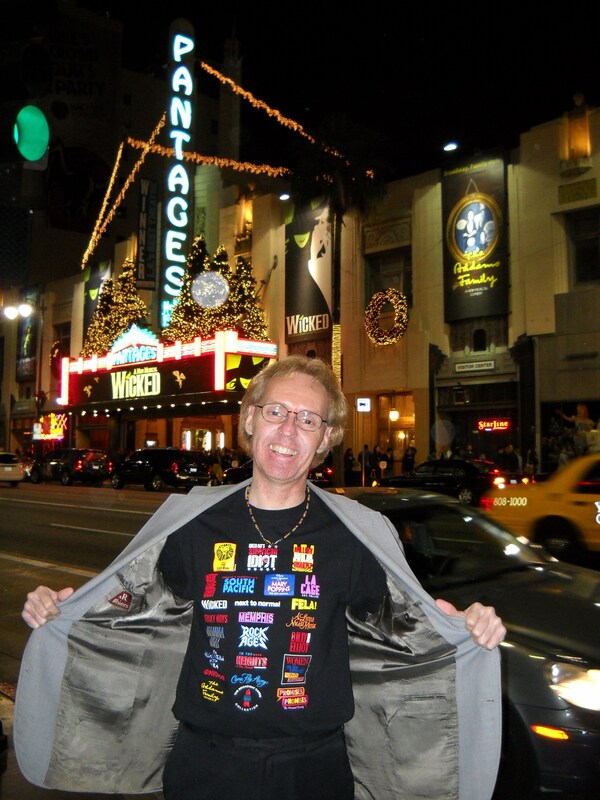 Then, in May 1992, the two groups merged to become “Broadway Cares/Equity Fights AIDS“. Sure, the disease may no longer be an automatic death sentence, but it can be a life sentence involving, at the very least, constant vigilance. Fortunately, BC/EFA has become the major supporter of seven programs at The Actors Fund including the HIV/AIDS Initiative, the Phyllis Newman Women’s Health Initiative, the Al Hirschfeld Free Health Clinic and more. Among the programs they have initiated are “Classical Action”, which draws on the talents and generosity of the classical, opera, and jazz communities to raise revenues for AIDS services, and “Dancers Responding to AIDS” (DRA), the dance world’s ongoing response to the crisis. 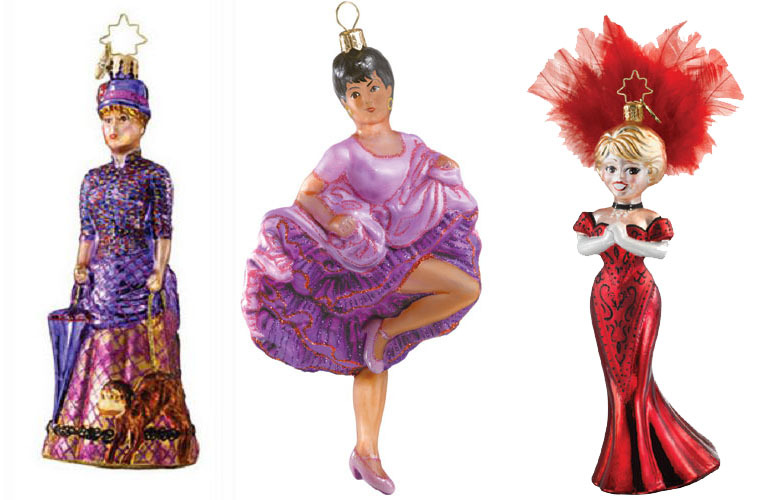 Make Your Tree Truly Legendary This year With These Lovely, "Legendary" Leading Ladies-Chita, Carol & Bernadette! The idea to create show-themed materials got started back in 1998 with a little inspiration from Bloomingdales Department Store. “They wanted to do a Broadway line of merchandise and they wanted us to benefit from it,” he explains, “so they devised four things–a globe, a sweat shirt, a Tee and beach towel”. For three years, the store sold these during the holidays with the proceeds going to BC/EFA. Once the promotion ran its course, customers who were by then used to finding such one-of-a-kind wares began contacting their offices directly with questions regarding where and when they might again become available. “I thought why don’t we try to do our own line comparable to what Bloomingdale’s did, but alternate products every year?” Peter relates. Thus, in 2002 the official on-line version of the store itself was established. 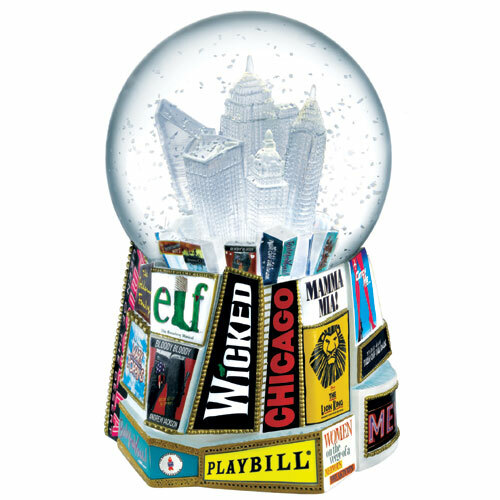 Perfect For The Holidays: "Broadway Cares' Distinctive, One-Of-A-Kind, "Fun-Of-A-Kind" Snow Globe! “We do a whole new line every Fall, and every month we try to introduce something original,” affirms the Manager, referring to how they regularly update select items and staff picks, resulting in terrific savings! Where else can one find such a remarkable assortment of red-ribbon commemorative gifts? Also among the myriad of “Must-haves” are books, CD’s, tote bags, jewelry, clothing, opening-night mementos, gift-baskets, food and flower arraignments–whether for winter-time celebrations or whenever! There’s even specific lines of gifts and objects relating to their “Classical Action” division; while for the dancer or dance enthusiast, some terrific products designed especially to benefit DRA. All can be shipped anywhere, and best yet, every purchase serves and encourages BC/EFA’s mission in the important work they do. When it comes to what gets produced, Borzotta himself gets the final word, yet he admits “I have several people I run things by though; for instance, if its clothing, I usually pace around the office and say, ’is this in style? Would this jacket appeal to both sexes? 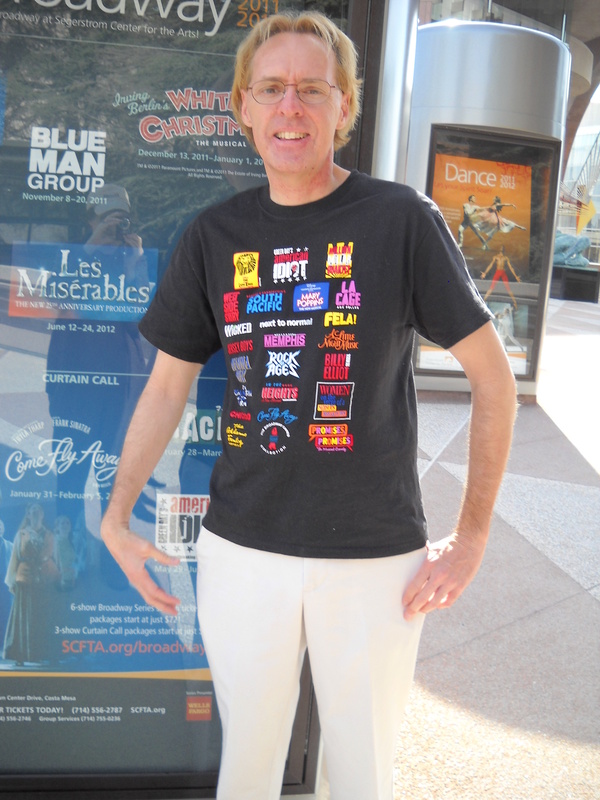 So I like to get people‘s opinions too.” Furthermore, Peter observes that the business handling all the silk screen printing for the “Broadway Cares” T-shirts, is a company situated in Ohio called ‘Night Sweats and T-Cells’”. “Its run by people who are actually living with HIV and AIDS,” he reveals, demonstrating one of several examples of how this association puts its constructive philosophy into action. Through it all, Borzotta maintains that their trademark “Snow Globe” displaying all the show logos representing a current season, also remains hugely popular. Now something of a tradition, he recounts that a friend of his who happened to be a set designer fashioned the first globe that the fundraisers themselves undertook to market “–and they just flew out of here!” he smiles. Since then, they invite a different set designer every year to perform the same task. 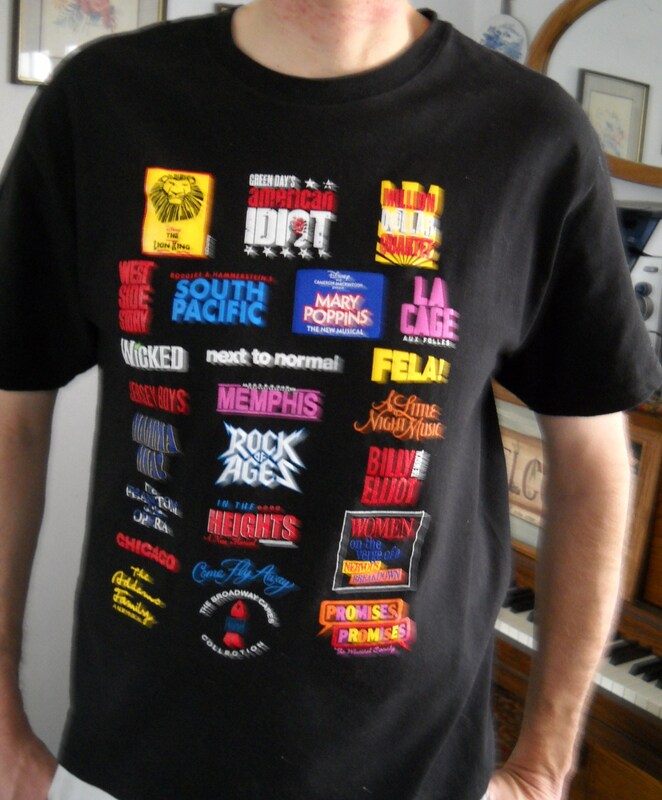 So too, this ‘logo-inclusive’ motif has proven to be such a winner, a whole line of similarly emblazoned articles is now available exclusively in the ’Broadway Cares” collection. Special to BC/EFA for the holiday season there’s even the “Broadway Legends” ornament collection honoring some of the most celebrated leading ladies of the Musical theater. In fact, among all the pieces he’s helped develop over the years, Peter confesses that these definitely rank among his own personal favourites. “We started with Angela Landsbury in ‘Mame’,” he states; “I just kept seeing that gold gown that she wore in that opening number and I thought it would be a beautiful, glittery ornament.” His instincts couldn’t have been better–in less than a season she completely sold out. Then another devoted to Chita Rivera quickly followed, while last year Carol Channing, stunningly attired from “Hello Dolly” was immortalized in the same way. Currently for this season, none other than ‘Bernadette Peters’, vibrantly dressed as “Dot“, her character from the hit “Sunday In The Park With George” can be found. All continue to be highly prized. “We even have people e-mailing in August asking ‘who’s the next ’legend’?” he divulges. With these lovely figurines placed center stage on its branches, rest assured the one topping your tree won’t be the only “Star“ grabbing the spotlight! They’ve even toyed with thoughts of including some of Broadway’s most legendary leading men in the future, so might the likes of Nathan Lane, Joel Grey or Robert Preston also be taking their bows on a tinsel-laden bough anytime soon? “You never know what’s coming next year!” their potential planner laughs. 'Silent Night'? Not With All These Amazing Voices! Each CD Makes A Wonderful Addition To Any Holiday Music Lover's Collection--Every One! 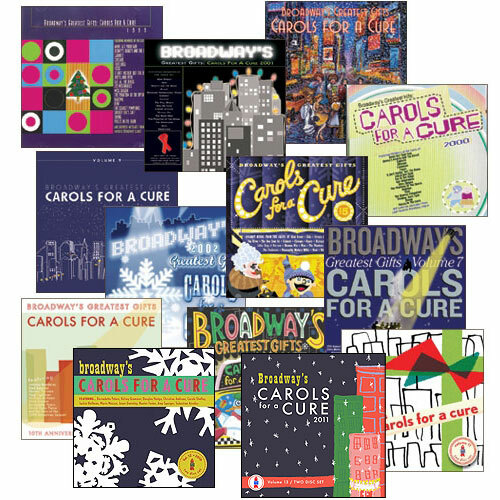 Yet another way to ‘make the season bright’ is the “Carols For A Cure” CD series. An annual holiday favorite the last thirteen years, Broadway casts from some of the biggest hits each season, have come together to provide their renditions of Yule-tide melodies both familiar and original. Likewise, this year’s edition comprises a two-disc set and features a passel of ’merry little showstoppers’ performed by the companies of “Anything Goes“, “Billy Elliot“, “Memphis”, “Mamma Mia”, Daniel Radcliffe and the troupe from “How to Succeed in Business Without Really Trying”, and those ‘Heavenly voices’ from “Sister Act“, along with many others. All the previous editions are available as well, and make magnificent additions to anyone’s holiday music library. 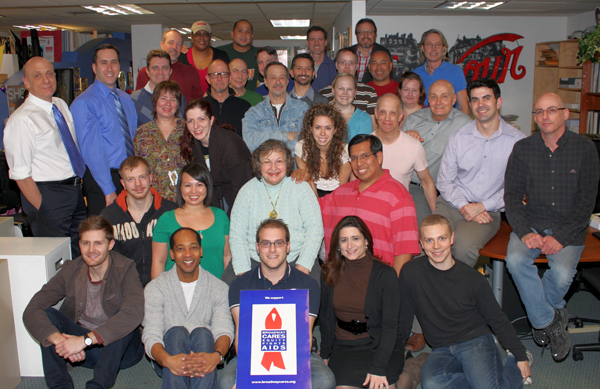 Still Showing Us The Way: It Takes Incredible People To Make An Organization So Incredible, And Here They Are--The Staff Of "Broadway Cares/Equity Fights AIDS"
Merchandise Photos Courtesy DiMicco/Longcore NYC ; Special Thanks To Peter Borzotta and the staff of “Broadway Cares/Equity Fights AIDS”, and to Corey Chambers and Lance Perkins for their kind assistance in making this story possible. Extra Special Thanks To Jesse Archer For Providing The Inspiration For It As Well, By Continuing To Call Attention To This Awesome Organization. Greetings Of The Season, One And All! This entry was posted in Uncategorized and tagged BC/EFA, Bernadetter Peters, Broadway cares/Equity Fights AIDS, Broadway Gift, Carol Channing, Carols For A Cure, Chita Rivera, Christmas Music, Christmas ornaments, Holiday CDs, Holiday Decor, Online shopping, Sunday In The Park With George, Theater gifts, unique gift items. Bookmark the permalink.